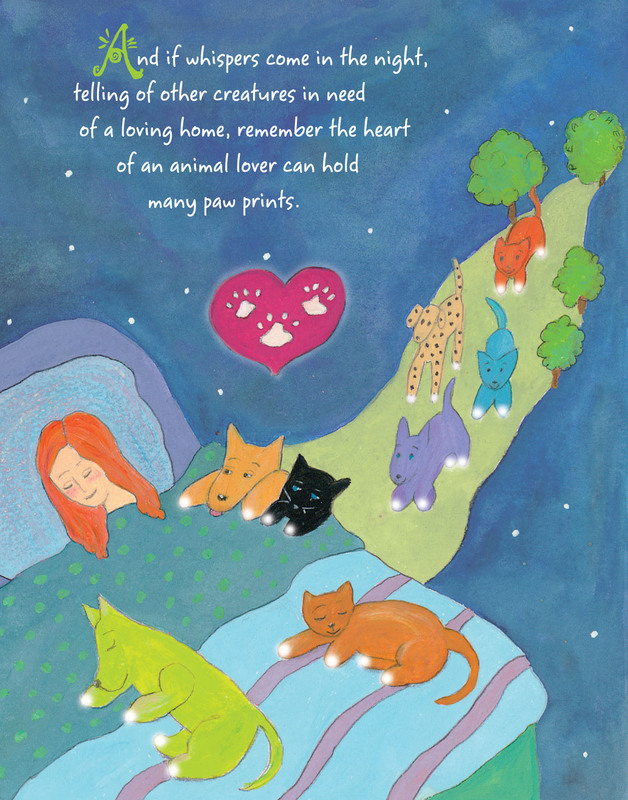 For anyone who’s felt the empty, aching void left in their heart by the loss of a beloved animal companion that no tears or words can seem to fill, any of Christine Davis’s beautifully-illustrated gift books will tenderly help to fill and heal it with loving and beautiful thoughts and images. Forever Paws celebrates the magic of our bond with our pets of any species, and our eventual reunion with them after we’ve crossed over and meet with them beyond. The comforting rich turquoise book cover and the calming violet end papers lead into a colorful world of starry backgrounds and pastoral pictures where polka-dot dogs and stripedy cats along with whimsical horses, bunnies, mice and birds all proudly display their glowing, magical paws, hooves, feet and claws as they wait in the hereafter for their human companions to join them. And those human companions, with the impressions of those paws prominently impressed on their hearts, watch and wait and wander until their time comes to leave their tired old bodies and, led by the light of those Forever Paws, find their way to the bridge in the stars to meet again and spend eternity with all the animal companions whose paws have touched their hearts. This story and its detailed illustrations as well as Christine’s other illustrated books are not simply the fanciful imaginings of an animal lover but the real stories of her own experiences with animals she has loved and lost, turned into art. 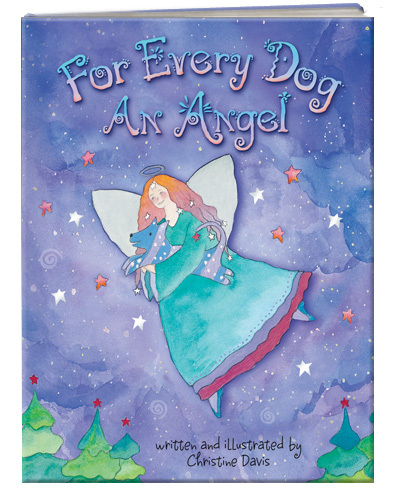 Years ago Christine’s forever dog, Martha, inspired her first illustrated book For Every Dog an Angel and launched an unexpected career in creating illustrated story books, and from there the cats and dogs who have shared her life inspired a series of similarly lovely and deeply touching gift books: For Every Cat an Angel, Old Dog & the Christmas Wish and The Shelter Dog. “Many Paw Prints” from “Forever Paws”, provided by the author. Years ago Christine’s forever dog Jake found a litter of abandoned kittens under the deck, and Christine took them in, bottle-fed them and raised and kept all four, Dickens, Pippin, Molly and Star. At the end of 2010 one of those cats, Dickens, was unexpectedly diagnosed with cancer so advanced Christine had to let him go just hours after the diagnosis, then she discovered Dickens’ sister, her forever cat Pippin, also had cancer and lost her just a few months after Dickens. Losing two cats that close together can leave an animal lover of any depth reeling and complicated grieving—how can you do justice to two loving souls who’ve shared your life, at the same time? And then consider the relationship of the four siblings, now parted, the depth of saving their lives, bottle-feeding and raising them to happy healthy cats, and even the long-ago bond with Jake, who had found them. A tender heart might never mend. Mewsette studies all the animals drinking from the “River of Tears”. Forever Paws is that book, “a loving gift from my precious feline friends…”, Christine’s own exploration of her grief turned into the universal story of our relationship with our animal companions: we meet, our lives lovingly intertwine, and though they must leave they take a little piece of our hearts with them and leave their pawprints in its place, then enjoy a peaceful and happy existence with other beloved animal companions, drinking from the river of tears and dancing among the stars until we go to join them. And even though they are not physically with us, they are always available to us, watching over us. Oh, that Purgatory could be so sweet. I like books, and despite the fact that more often than not I enjoy audiobooks to save my eyesight for my art and illustration, I still like to hold a book, illustrated or straight text, read from its pages, and let it carry me off through my imagination to another world. I can take a book off into the woods and not worry about devices or batteries or jostling the thing while I’m climbing down a steep path to my favorite reading spot along the trail. A book is always ready for me. Mewsette comforts Jelly Bean as they remember Peaches. When I lost Peaches in October 2010, Christine sent me a gift copy of For Every Cat an Angel, and while I’d been corresponding with her and studying her style on her website and blog, I finally had a chance to study one of her books. What a pleasure to see not only her illustrations combined with her story and to experience the story as she intended us to see it, but also to admire the details of the book itself, the quality dust jacket and its sturdy bound cover, the book’s size and shape, just right for carrying along for comfort and holding to study each page and enjoy its message without being overwhelmed with details of content and images. Christine published Forever Paws in late 2011 and sent me a review copy and a note that told me she’d taken the liberty of hiding the names of some special animal companions in the artwork, and had placed a bookmark in the page where I’d find Peaches’ name. I’m so proud that Peaches is forever remembered in this book that will touch the hearts of so many. Christine also didn’t know that this book had reached me at an auspicious time for another reason. I wanted to immediately share this book with everyone, but I also knew the extent of Cookie’s illness and every time I sat down to begin my review I could not focus and knew I’d have to wait until…after. I lost Cookie in February 2012. Cookie’s paws have been burnished in my heart for years, and now she waits for me and I can think of her among the stars and the green grass with the other loving animal companions in Forever Paws. Because the holidays can be a difficult time when grieving a pet, Christine has placed the e-book version of Forever Paws on sale for just $3.99 through the end of 2017. It is available from both Amazon and Barnes & Noble, and the B&N volume is narrated by Christine herself. Visit her Lighthearted Press website to look at all of Chris’s books, read about her cats, stories of all her animal companions and remember her work when you or a friend unfortunately lose an animal companion. Because I love to study the work of other artists and discuss style and technique I profiled Christine for my feature Creating With Cats. Hers is another story of someone who had didn’t start out as an artist but ended up that way, inspired by her cats and other animals in her life. When you read an illustrated book, do you ever study the illustrations and wonder about decisions the artist makes about medium, technique, style and even subject? And what about the book’s physical size and shape, the whole little visual package in addition to the story that’s in it? Often some or all of these decisions are assigned by an editor or art director working for a publisher who may have chosen an illustrator for their particular style or familiarity with the book’s subject matter. But when you are the writer, illustrator, editor, art director, publisher—and marketing department, shipping department, receptionist and all else that goes into making a book—all those decisions are made, or at least begun, with one person. And so it is with Chris Davis, who began with a story and a vision, and ended up with a small publishing company to create, print and distribute her stories just the way she wanted them. While many people self-publish today, Chris began her venture in 1997. And while Chris said she’d written and managed many and various things while in “corporate America”, she’d never attempted artwork of any sort, but now she has to her credit five illustrated books featuring cats, dogs and other animals. Chris describes herself as a “stubborn New Yorker” who is used to “doing things her way”. As a fellow artist I understand this to mean that she has a clear vision of what she wants and of the best way to accomplish that, in this case to tell her story, and she will achieve that vision by whatever method it takes. She actually began her working career while still in New York and “bounced back and forth” between gigs as a singer, either solo with her piano or with a band, and working temp jobs that required a very organized and detail-oriented problem-solver. While Christine grew up in New York, she has lived in Portland, OR for the past 35 years after following her muse across the country to such varied places as Tucson, AZ and Denver, CO to see where to best to live out her dream of living in and working with nature and all the creatures there; since 1991 in a house built on a quarter-acre wooded hillside. Her studio is in her dining room, and her cats enjoyed a unique and attractive outdoor enclosure built just for them. And while I associate her with cats after having initially read about the four sibling cats she lived with, Chris actually lived most of her life with dogs and began her career as a storyteller through a story inspired by her dog, Martha. Of course, her entire career as a published author and artist was inspired by her animal companions, and Chris reached for spiritual guidance as well. Chris relates that her forever dog, Martha, who’d traveled out to Portland with her, suddenly had what appeared to be a stroke, living two weeks in confusion and decline. Chris was determined to heal her but did not succeed. She’d been working with a Native American healer and drumming regularly and turned to her drumming for solace. She was given the title For Every Dog an Angel in this way and “told that people were looking for this book” though she was not given the story; that had to come from within her. Once she’d published this book people asked her for a feline-oriented book in the same theme, but Chris didn’t have cats then or know them very well at all. However, the universe provided them for her to learn about—that was when Jake discovered the four abandoned neo-natal kittens under the deck who they rescued and raised, and after getting to know them Chris could write For Every Cat an Angel with confidence. After sharing stories with Chris in e-mails and seeing her books I e-mailed her, telling her that I’d like to write about her experience and about the technicalities of how she creates her art and her books, to which she agreed. I sent her my list of typical questions including what medium(s) she used, how she determined what images would illustrate her story and how she actually painted them, and we planned to talk. In just a few days, though, Chris had written up her answers to these questions as an essay and sent it back to me—an example of her quick and organized methods. While I’ve been writing all my life, I’ve never studied art and never knew I’d be illustrating my books. The closest I’d come to creating art was doing the company picnic posters back when I worked in corporate America. It was a big day when I added a red magic marker to my usual black marker and really jazzed up the poster! Sample of Chris’s illustration style. My beloved dog, Jake, was the inspiration for my books Old Dog & the Christmas Wish and The Shelter Dog. The Christmas book is very special to me, because it was the last book I wrote with Jake still by my side. There are several sketches of Jake that were used in the book. 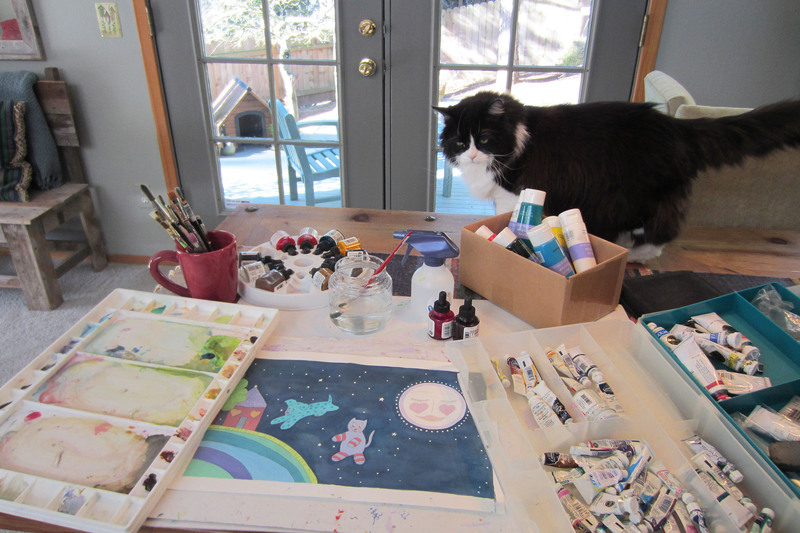 Until I wrote Forever Paws my main medium was always watercolor. I’m deeply connected to water, so when I paint with watercolor I use a lot of water, which helps to get the “flowy” effect in the art. Forever Paws was painted with watercolor and acrylic – plus a liberal sprinkling of fur (just can’t seem to get that out of the artwork!). It was the loss of my dear sibling kitties, Dickens and Pippen, that led to the writing of Forever Paws. Losing them to cancer, within a few months of each other, left me brokenhearted. I knew that Dickens, Pippen and Jake were together again, but I missed them terribly. Then I began getting these colorful images of the fabulous time they were having up in the stars. I saw flying dogs and cats, glowing paws, a river of tears…even a dragon! The message from Pippen was clear – there was another book to be written. I wrote the story fairly quickly, then began the task of bringing to life all the visions I had seen. One page in particular was quite challenging – the page with the woman holding out her arms and her critters touching her heart. When I first sketched that page it was a completely different picture. After I painted it I could tell it wasn’t quite right. I drew the same picture a second time, but painted it with new colors. It was still wrong. For a third time I drew the exact same picture, but I simply couldn’t bring myself to paint it. I realized I wasn’t moved by the art, and changing the colors wouldn’t solve the problem. I sat at my table, closed my eyes, and held out my arms, asking the universe to please show me what I was supposed to paint. And then I heard two words. I knew what that meant – paint this moment, with my outstretched hands, open to all possibilities. So I picked up my pencil and drew the picture that appears in the book. It came effortlessly. I looked at the woman’s face and saw so much love and beauty there. I am particularly drawn to the spiral shape, and drew spirals all around the woman. Suddenly both the picture and I were at peace. It was several days before I painted the illustration, but when I did I knew I had found what had been missing from the first piece of art. This page is really what Forever Paws is all about! I really love the story of the illustration “Open Arms”. While I’m sure all illustrators have their own way of visualizing what they’ll do and then creating their visualization in their medium, it isn’t always a straightforward creation, even when you are working for yourself. “Open Arms” helps to explain how even what you had thought was a good illustration can turn out to be the wrong one, and how visualization sometimes needs to be creative in itself in order to get to the right place. And like most illustrators I know, she gives each of them a title as she is working so she has a convenient way to refer to them to herself or to others. In addition to what Chris answered above, I had always noted her strong palette of colors: blues, greens, purples, natural choices for as much as Chris loves water and its imagery and said her entire house is done in these colors (and I will note that even in her essay each of the book titles was in a different shade of blue, purple or green). Another artist had mentioned to Chris the idea of using complementary colors like blue and orange and purple and yellow which are sort of “opposites” and which enhance the qualities of each other when used together. I had noticed a good bit of various shades of orange in Forever Paws and Chris said the use of orange was “a new thing” for her. “Woman with Cat and Dog” from “Forever Paws”, an orange background with the blues and purples. Often the size, shape and binding of the book are determined by the publisher or by a convenient template or materials available at various printers, but in this case Chris decided that as well. She had the idea of a gift book and visited bookstores, looking at, holding and reading gift books until she found one that was “just right” and patterned her book after that. In addition, where certain pages or parts of a book are often left blank, she decided to add at least minimal color or artwork to pages that don’t often have anything, such as the end papers with the starry violet pattern, and a few violet stars here and there on front matter pages that are usually only text. Cat Lover Comfort Gift Box from Lighthearted Press. Chris also carries the same themes, styles, colors and even artwork through all of her promotional materials as well, and while she sells her books from her website much of her sales are wholesale to veterinarians. She has also developed a line of complementary products such as her Rainbow Bridge Wristband, and a line of pawprint and dog- and cat-themed tissue packages, seed packages, scented candles available together or packaged in a pawprint gift box. In the intervening years Chris lost Molly and Star, the other two kittens from the rescued litter, but she is certain that the universe will bring her another animal companion or companions, feline or canine or other, whenever the time is appropriate. There is another book too, born soon after the launch of Forever Paws that would chronicle Chris’s own personal journey, Breathing Fire. In addition, her unique cat enclosure has been reborn as a Celebration Garden. Visit her Lighthearted Press website to look at all of Chris’s books, read about her cats, stories of all her animal companions and remember her work when you or a friend unfortunately lose an animal companion. Chris sent me one of her books as a gift and one intended to be reviewed. Receiving those books did not influence my opinion of them in my reviews, and I received no compensation for any reviews or articles about Chris and her books. Read other articles in my Creating With Cats series and other Book Reviews. Bernadette, thank you so much for sharing the story of my books for animal lovers with your readers! As I read your words about my life I couldn’t help but wonder “Where did the time go?” The years certainly fly by, don’t they? I caught my breath when I saw the photo of Mewsette looking at the River of Tears page – it looked so much like my beloved cat, Star, who is now an angel kitty. Thank you, again, B! Hugs to you and your fabulous, furry felines! Chris, it’s amazing how time has steadily marched on. Mewsette does indeed look like Star did, especially when she was in the bird feeder, which is something Mewsette would do! Sisters in spirit, purrhaps. Thanks for your books, and your inspiration!